I was recently preparing for a presentation in Ohio and put together a chart that really surprised me. 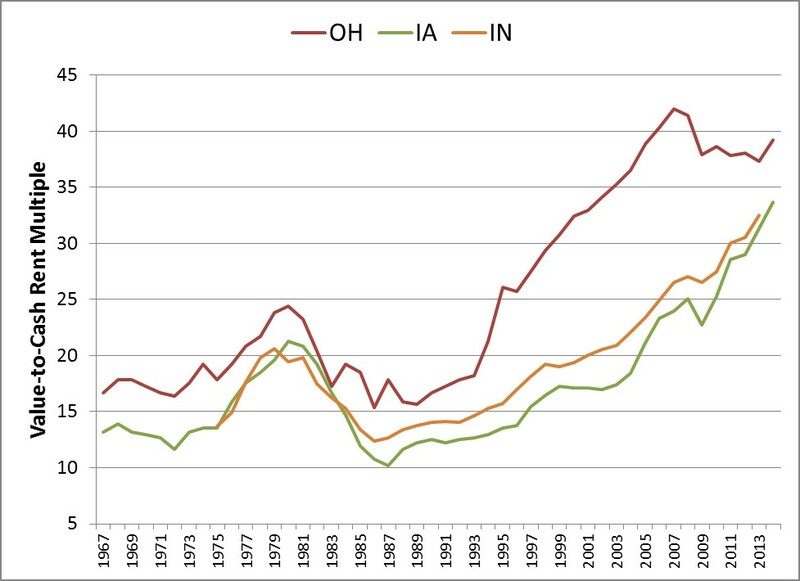 The chart below shows real farmland prices from 1960 to 2014 for Iowa, Indiana, and Ohio. I have used similar versions of this chart throughout the Midwest and typically find that farmland values have risen dramatically in this region. For instance, over the period of 2004 to 2014 real farmland values in Iowa, Illinois, Indiana, and Nebraska have risen by a high of 224% (Nebraska Irrigated farmland) to a low of 105% (Indiana). The reasons for these dramatic increases have been well documented. But I was really surprised that real Ohio farmland values have only gone up by 55%. After checking the USDA reported values several times – I was still perplexed. Most people might look at the chart below and think that Ohio is very cheap relative to Iowa. Figure 1. Real (2005 $’s) Iowa, Indiana, and Ohio Farmland Values, 1960-2014. Source: USDA-NASS. Looking at the chart one also notices a couple of strange features. In real terms, Ohio farmland values actually traded at a premium to Iowa farmland for a long period of time. From 1994-2007 Ohio values actually traded at a premium to Iowa, and at several points they exceeded Iowa values by nearly 30%. Today, USDA tells us that this situation has completely reversed and Ohio farmland is on average 64% as valuable as Iowa farmland. I think that most of us would have the initial feeling that perhaps Ohio values are low. So what exactly is going on? Is Ohio farmland undervalued, Iowa overvalued, USDA data inaccurate, or something else. The first key to understanding this divergence is to look at farmland value relative to income. To do this I calculated the value-to-rent multiple which is shown below. This measure paints a very different picture of the situation. 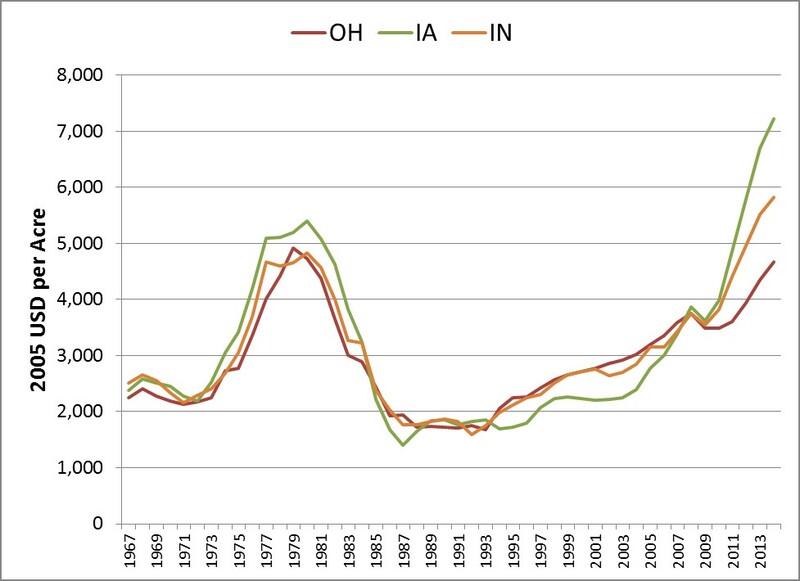 Here you can see, that relative to the USDA reported rents, Ohio farmland is trading at a higher multiple that either Iowa or Indiana, and it has consistently done that throughout the entire time period shown. While the current multiples are high for all states, the general relationship between them has held providing an important clue about the relationship between these two series. Figure 2. Value to Rent Multiple for Iowa, Indiana, and Ohio Farmland, 1960-2014. I would suspect that Ohio farmland values tend to be much more heavily influenced by development pressures. This would help explain why Ohio values have not trended upward as quickly when farm incomes increased. It is also likely the case that there is a very wide diversity in the types and qualities of farmland available in Ohio and perhaps this likely makes the state’s overall average a bit difficult to understand. While there is clearly diversity of quality and development potential in Iowa as well, the differences are likely greater in a state like Ohio. So what is the lesson of this activity? When it comes to farmland make sure that you examine both the income and the asset price and realize that sometimes the averages may not tell the whole story. I would expect that if you happened to find two parcels of similar productive capacity and development potential with one in Ohio and the other in Iowa they would trade at about the same price. Want to learn more about farmland values? For those interested in learning more, click here to follow the blog and stay connected as we will continue to observe these trends and continue providing the data, charts, and insights.